'War Service Dress, Trousers'. By Chas. Williams & Co. Ltd. Size 00 (Ht.5'0" - 5'1", Wt. 31", Seat 35" - 36", Leg 28"). 1944 dated. 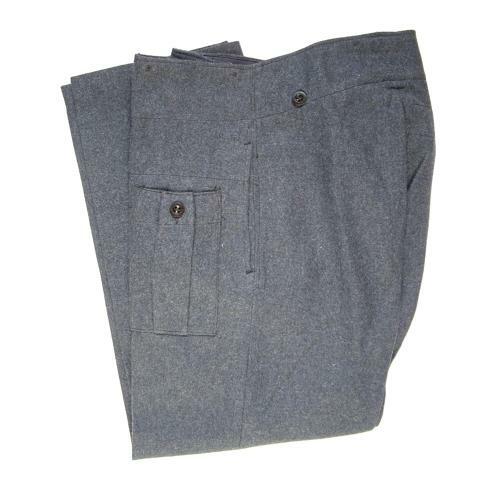 Standard issue battledress trousers complete with buttoned non-flapped dressing pocket on the upper left leg. Button fly. These are in superb 'as new' unused condition straight from the basement of what used to be an old outfitters. Very clean with no visible moth damage. Not as small as the size label might suggest due to the high waist, physically measuring 40" from waist to ankle at the side seam. You will not find better pair. Stock code U22607.